I've been having a quiet spell lately with no sign of anything down at the coast (my pals are catching the odd bass now so things may be looking up). 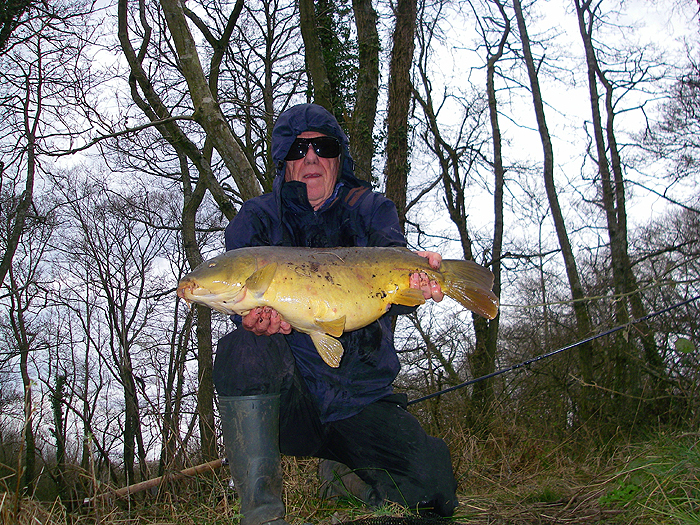 Anyway, I've had two, one-hour, sessions carp fishing Saturday and yesterday. On Saturday - a nice sunny day - there were a few people in bivvys with three or four rods on rests in operation but seemingly not catching much (anything?). 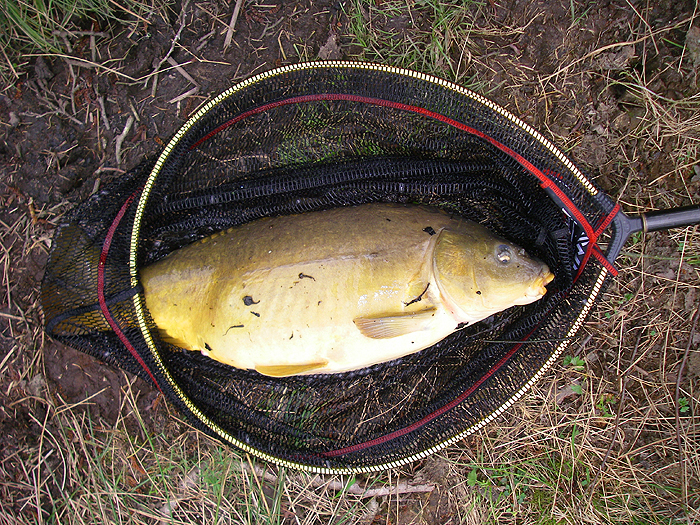 I walked round the lakes and found quite a lot of slow moving carp which I estimated as 8-10lbs apiece. I first noticed them when my foot accidentally kicked a root and the bow waves shot away from the edge. The fish didn't even look at my strategically placed piece of crust but I noticed, as I stood watching, that they were occasionally more active under the scum blown into a corner by the breeze. I made a mental note of the fact. When I returned yesterday it was a much duller day but still pretty mild with little wind. This time I started by dropping my bait - a big cube of crust - into the scum six inches from the bank and laid the rod in the brambles. After twenty minutes a fish nosed the bait and left it. I waited, thinking that the fish knew where the bait was and would probably come back. Ten minutes later another one (or possibly the same one) sucked the soggy crust off the hook. As I attempted to retrieve the hook now tangled in the twigs I'd cast over and broke off. I'd moved forward as I tried to yank it free thinking "that's buggered it" but, ever hopeful, I tackled up and cast to the same spot again. Ten minutes later I had to grab the rod as it was dragged over and after a good old tussle I landed a near 19 pounder (just under). Nice to catch something at last. As I walked back to the car the bivvy brigade still appeared to be struggling - which is nice! I quite enjoyed my carping but as I said the lads have had a couple of bass recently so, weather permittng, I'll be trying my foetid mackerel at the weekend. It took me four goes to get a selfie that wasn't shaken or stirred.